The shocking victory of a white nationalist President and his political party in November 2016 led me to wonder about the fate of the many diverse books making their way toward publication, particularly those with themes related to Black Lives Matter, immigrant rights, and by and about LGBTQ+ people. In fact, I know of only one book that was cancelled or postponed as a result of the election, acclaimed nonfiction author Susan Kuklin’s OUT OF THE SHADOWS: VOICES OF UNDOCUMENTED YOUNG ADULTS. In consultation with the nine young people she interviewed, she decided to pull the book and rethink its presentation. 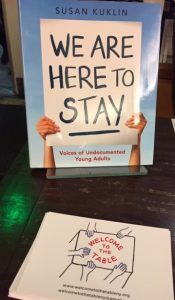 Two years later, the same interviews have come out from the same publisher, Candlewick, in a volume titled We Are Here to Stay: Voices of Undocumented Young Adults. What’s different is that many of the interviewees have been forced back into the shadows, which means their full names and photographs have not been used. 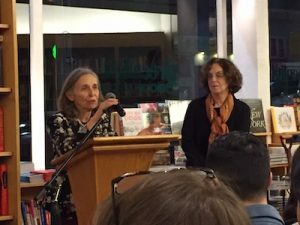 And when four of the courageous young adults, all of them now in their twenties, participated on a panel with Kuklin and immigration lawyer Mary Ellen Fullerton, at Greenlight Bookstore in Brooklyn last week, I decided not to use their first names or their pictures, as I don’t want to do ICE’s work for them unwittingly. I know what it’s like to live in a police state. 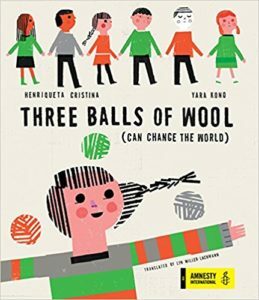 Co-sponsors of the event were Candlewick, publisher of the book, and the organization We Are Here to Stay. 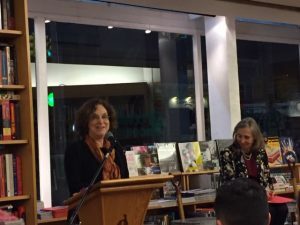 Author Susan Kuklin reads excerpts from the young adults’ interviews. Immigration lawyer Mary Ellen Fullerton talks about DACA and the court cases related to it.